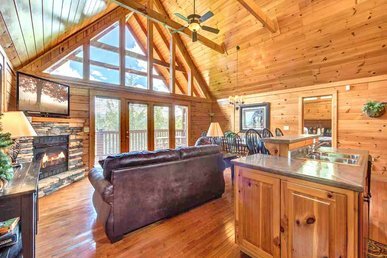 Set at the end of a quiet road, nestled among towering trees alongside a burbling creek, Stonebrook Lodge is a bastion of peace and privacy. 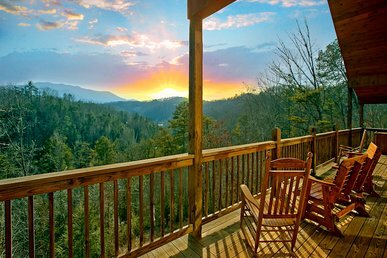 Instead of noisy neighbors and whizzing traffic, you’ll hear the singing of warblers and wrens during the day and the chirping of tree frogs and crickets at night. 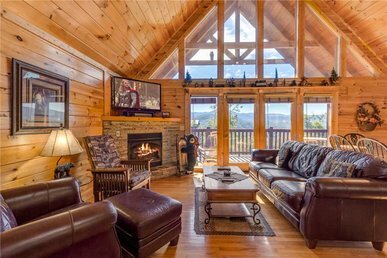 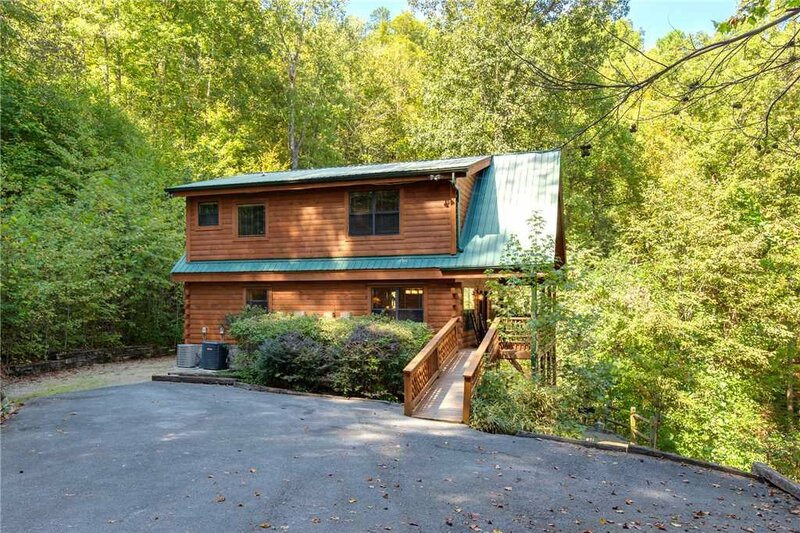 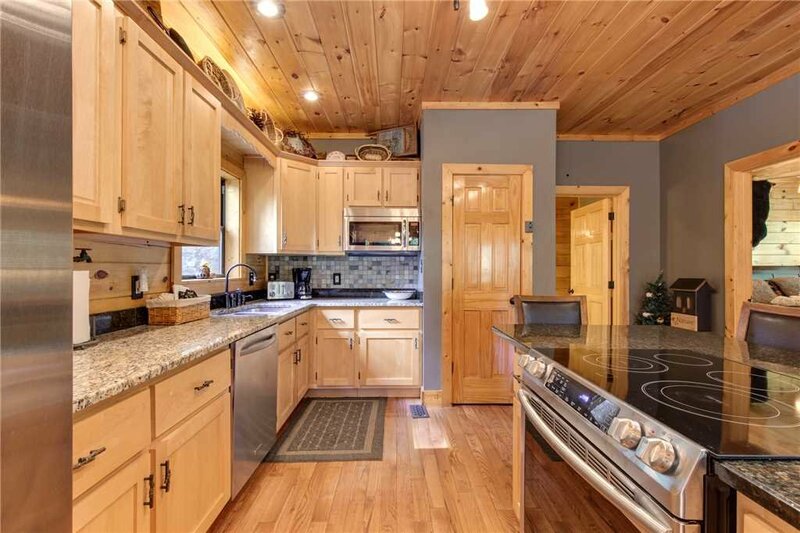 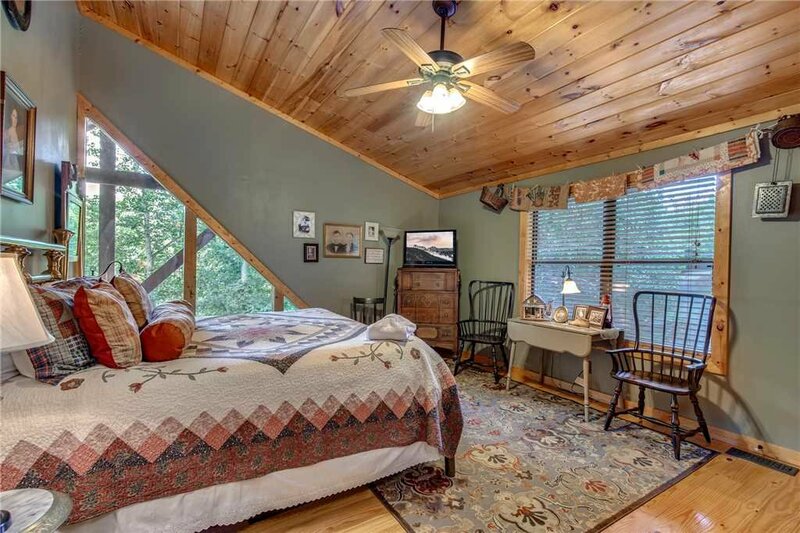 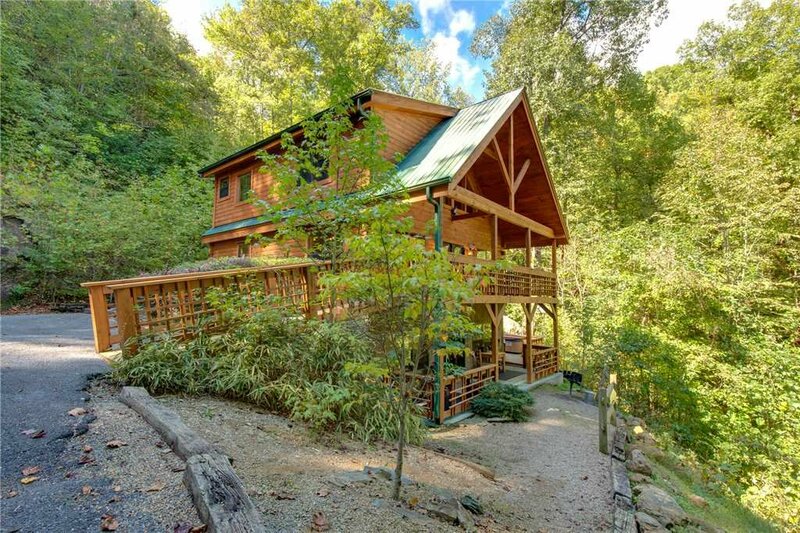 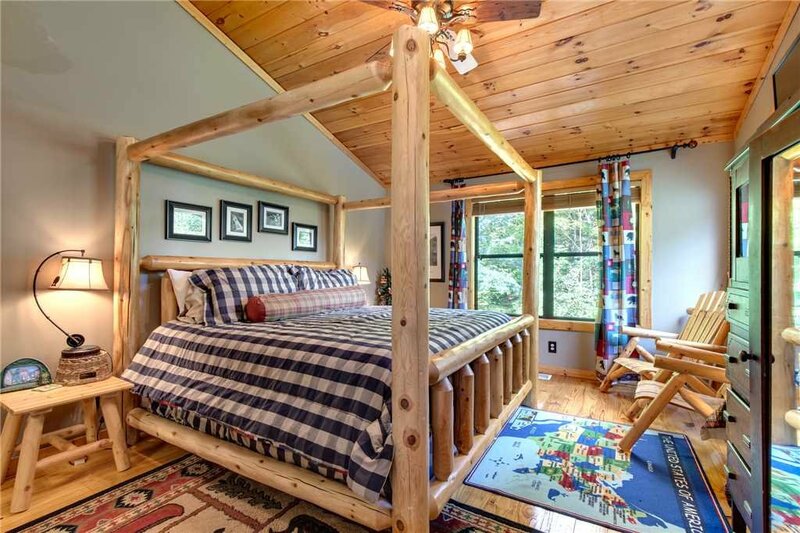 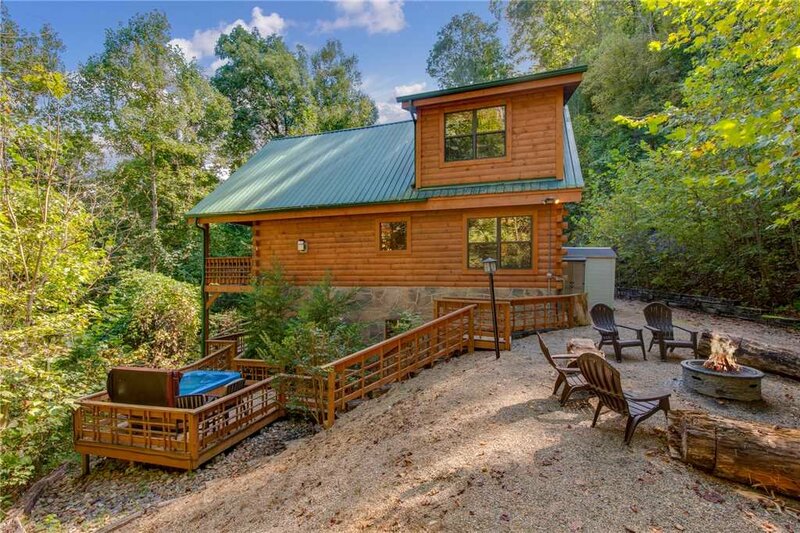 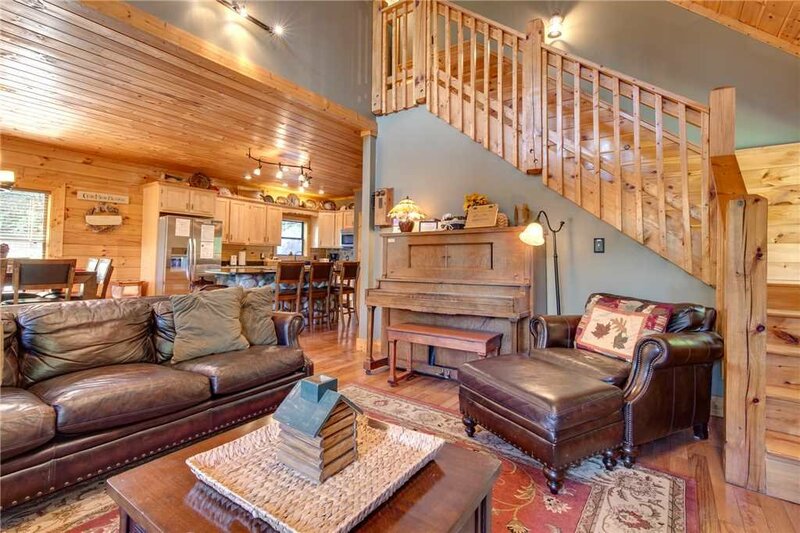 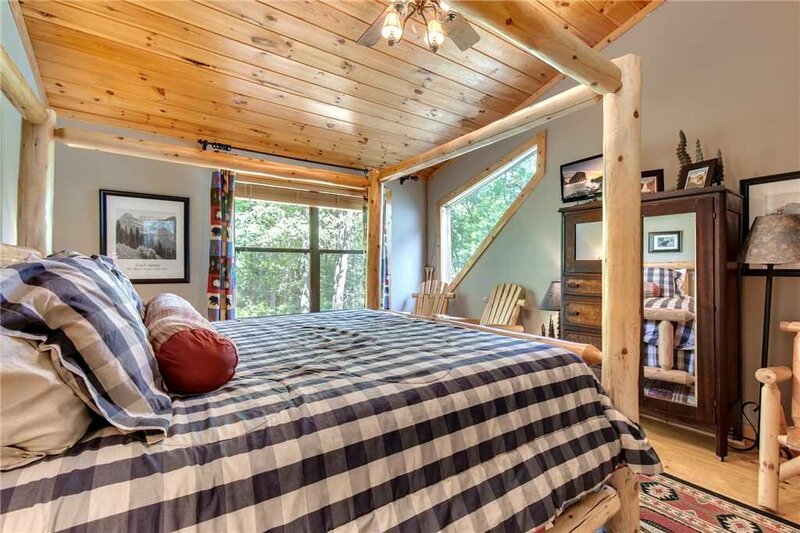 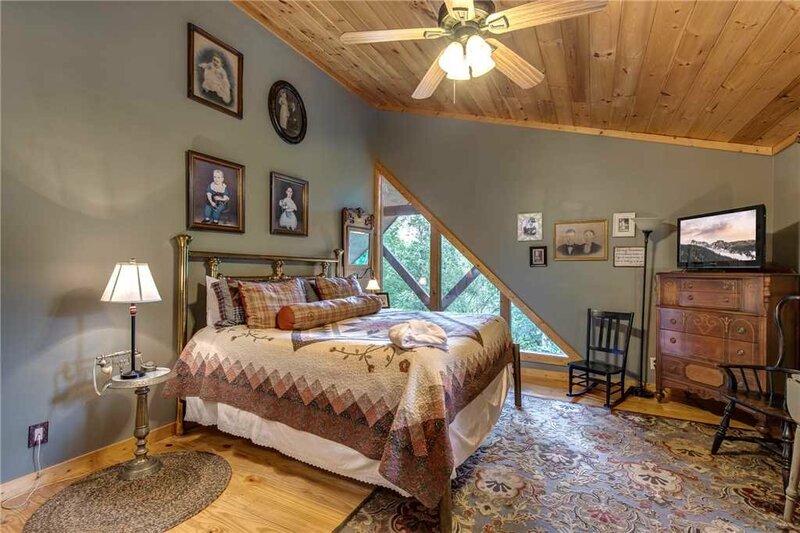 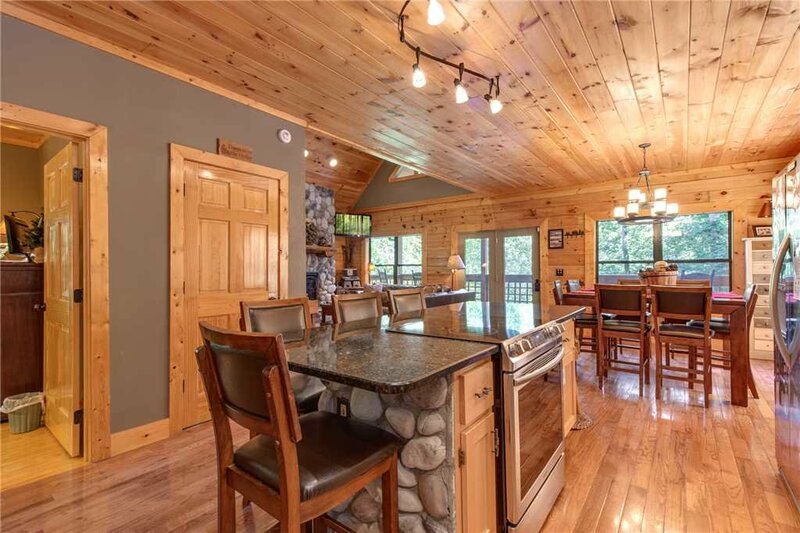 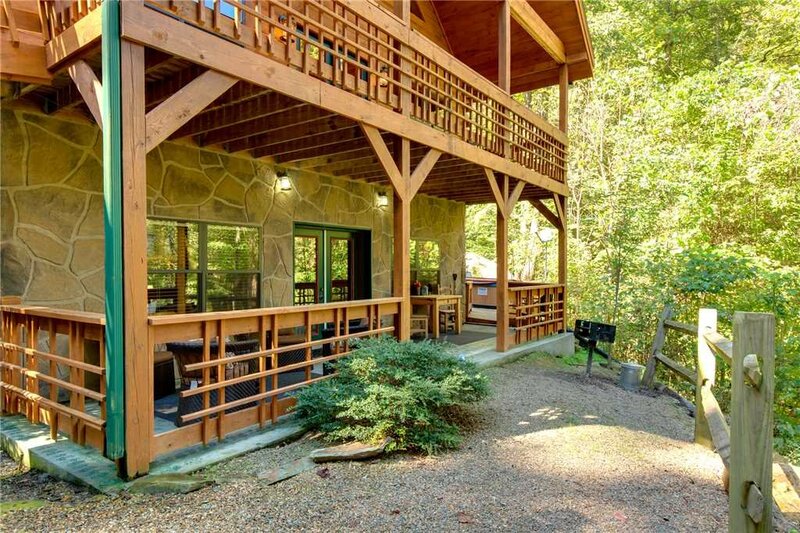 The three-story cabin offers plenty of pampering too, with a roomy hot tub on the lower deck, jetted tubs in all five bathrooms, and a home theater where you can watch movies on a 65” screen. 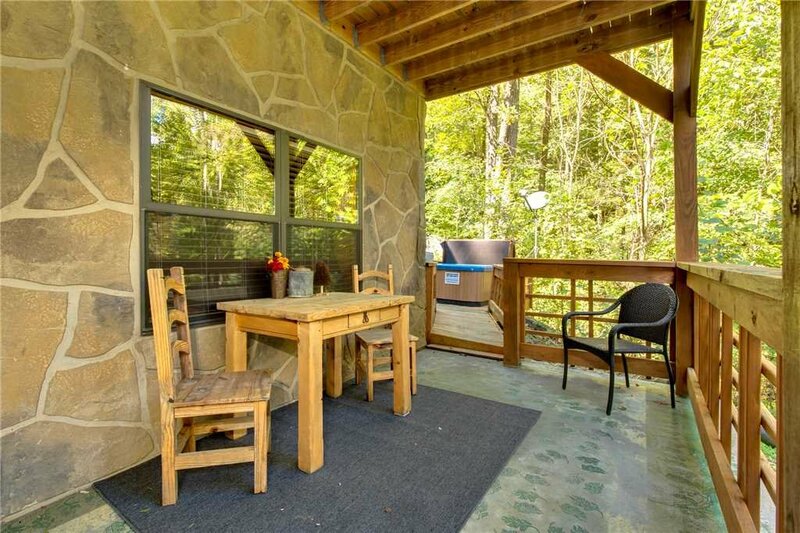 And because Stonebrook Lodge can sleep up to sixteen guests, you can share this retreat with friends and family. 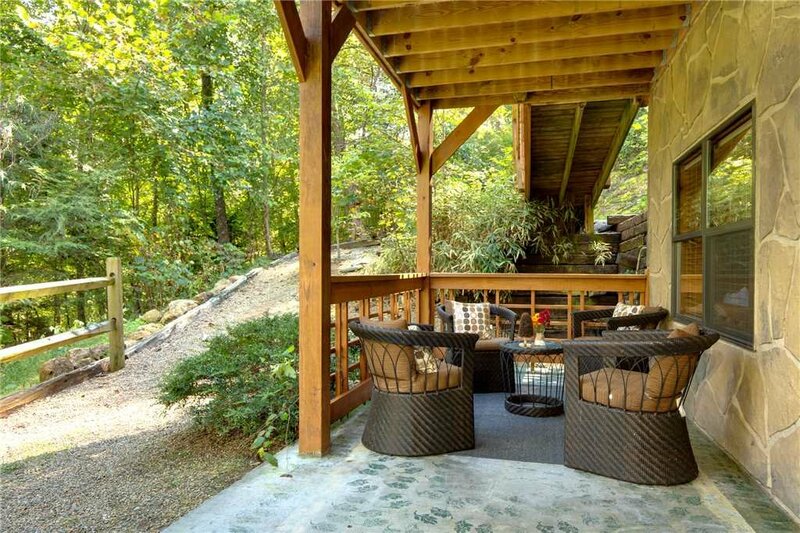 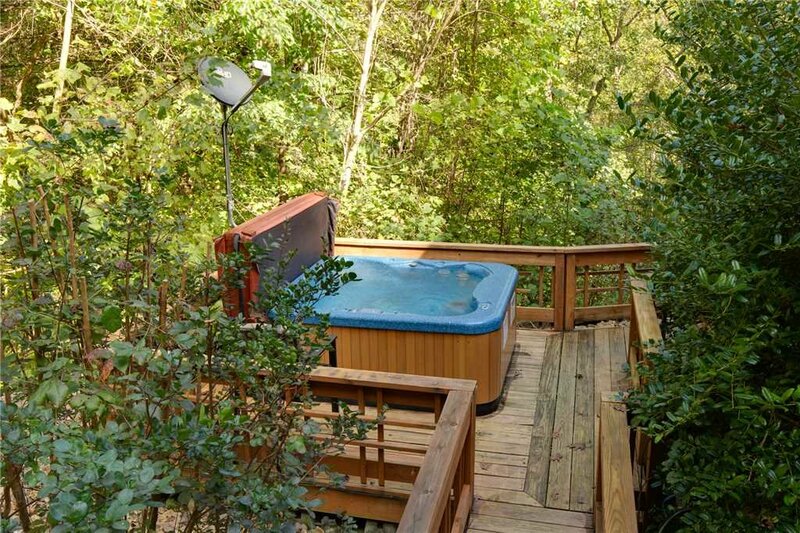 You’ll no doubt want to spend plenty of time savoring the woodland setting. 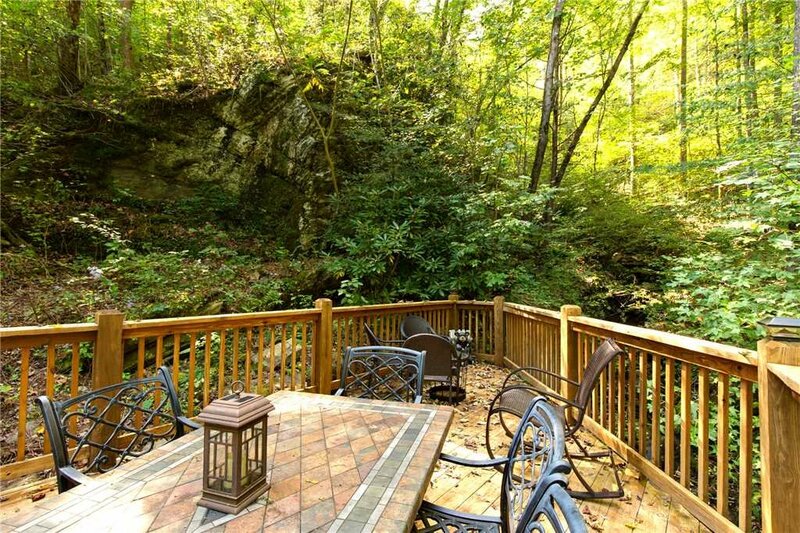 Fortunately, Stonebrook Lodge has numerous outdoor spaces where you can congregate with the others or escape for some me time. 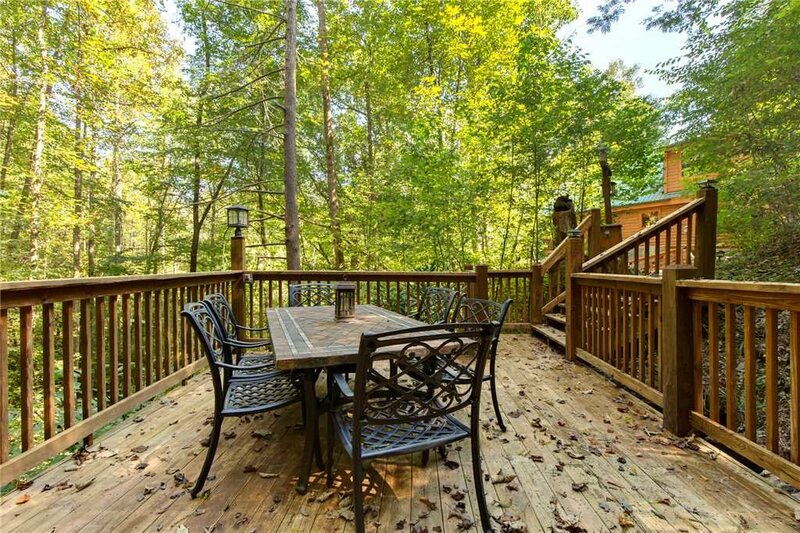 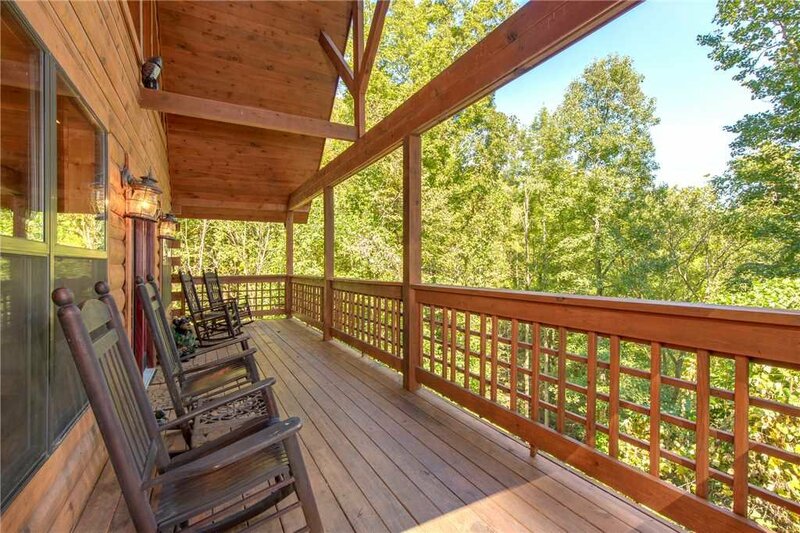 For starters, there are the two spacious decks, outfitted with rockers, chairs, and tables. 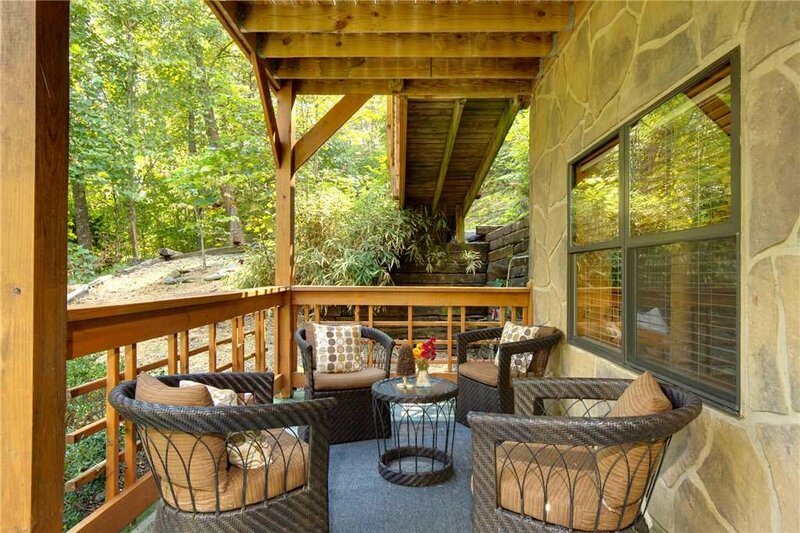 One especially charming nook, furnished with well-cushioned armchairs, is an ideal spot to sip your morning coffee or cool off in the shade, and a patio furnished with a dining table for alfresco meals. 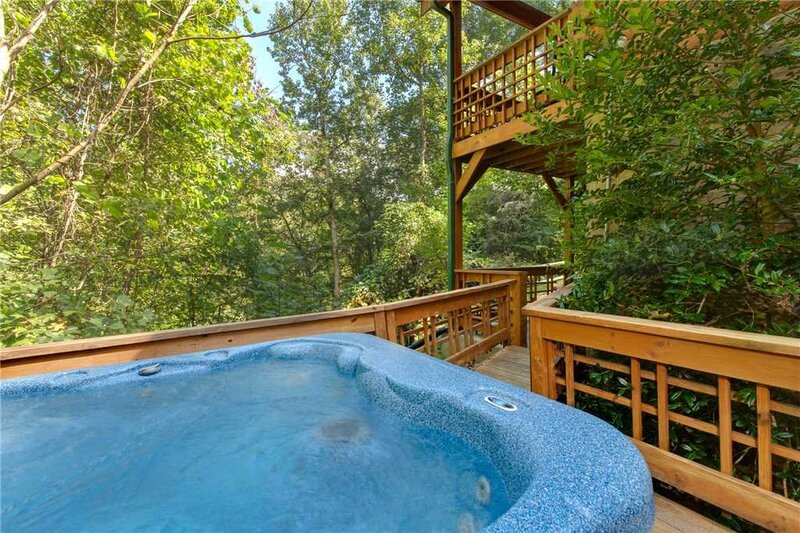 The lower deck is where you’ll find the hot tub; though soaking among steamy bubbles is always wonderful, it’s especially so when you can relish the caress of the mountain breeze as you luxuriate. 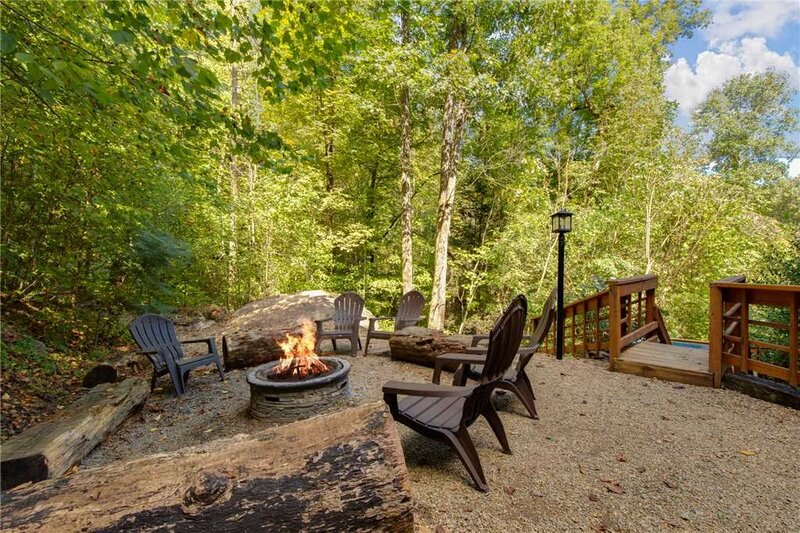 And the backyard fire pit, ringed with chairs and logs cut to serve as benches, is a pleasant spot to toast marshmallows beneath the twinkling stars. 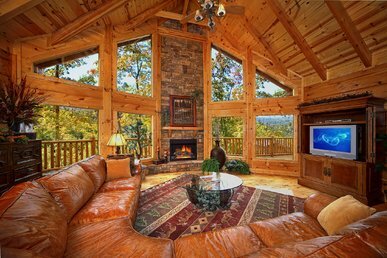 The interior of Stonebrook Lodge is as impressive as its setting. 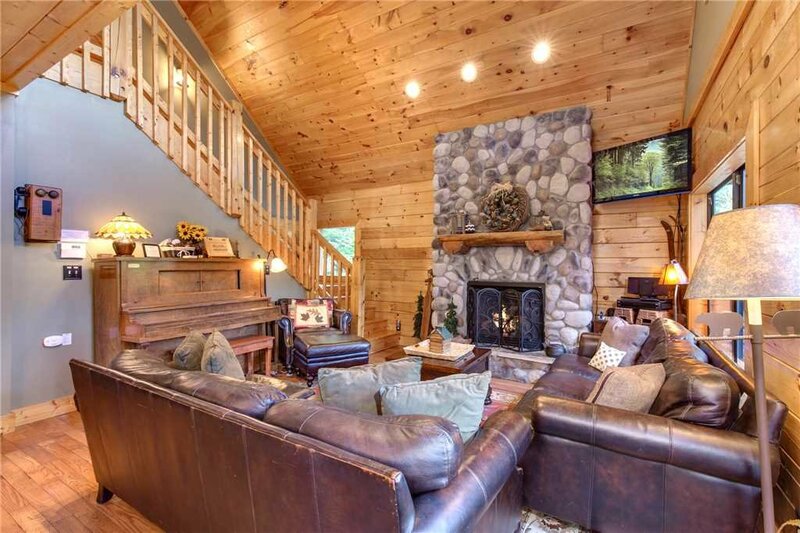 The great room makes up most of the main level. 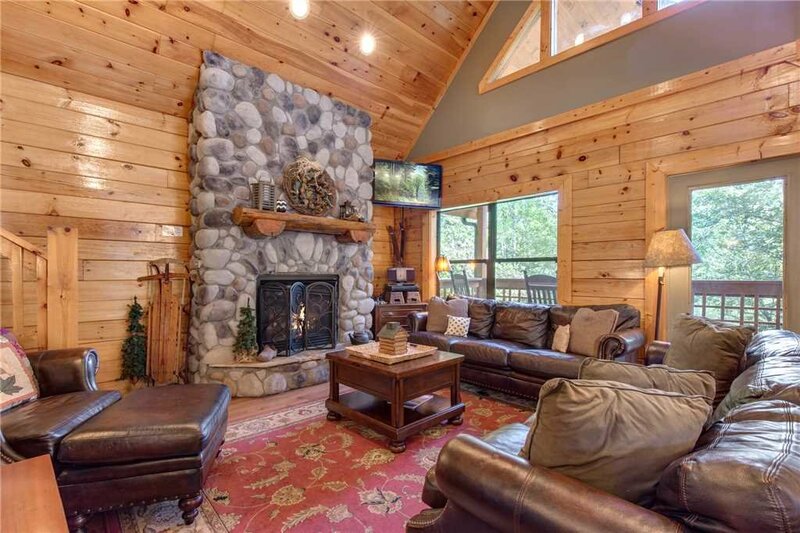 The cathedral ceiling, the large windows, the stone-surround fireplace, and the wood-planked walls and floor give it a warm, welcoming vibe. 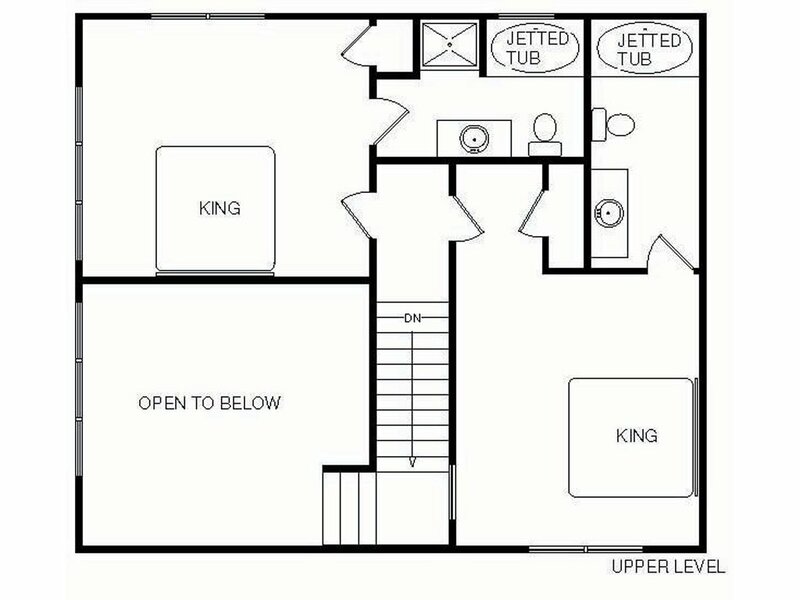 As well as a flat-screen TV with cable and free WiFi, there’s a piano and lots of comfortable leather seating where everyone can gather. 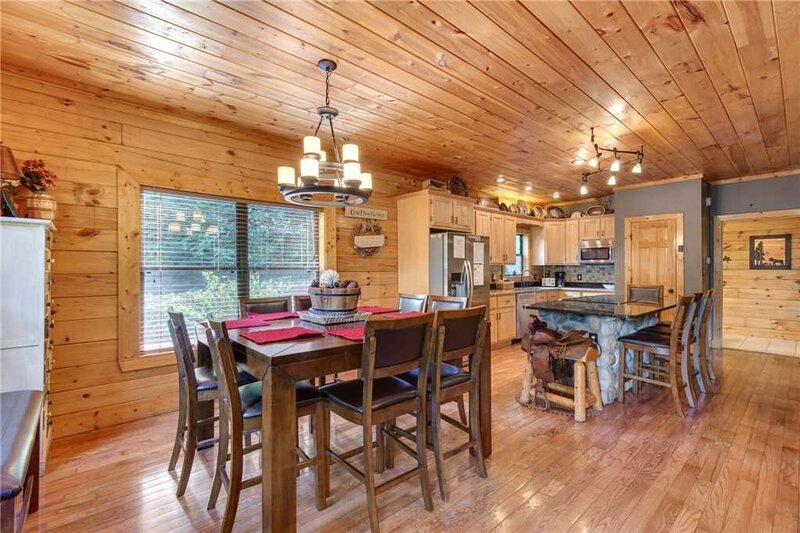 The dining area seats eight at the table and five more at the adjacent granite-top breakfast bar. 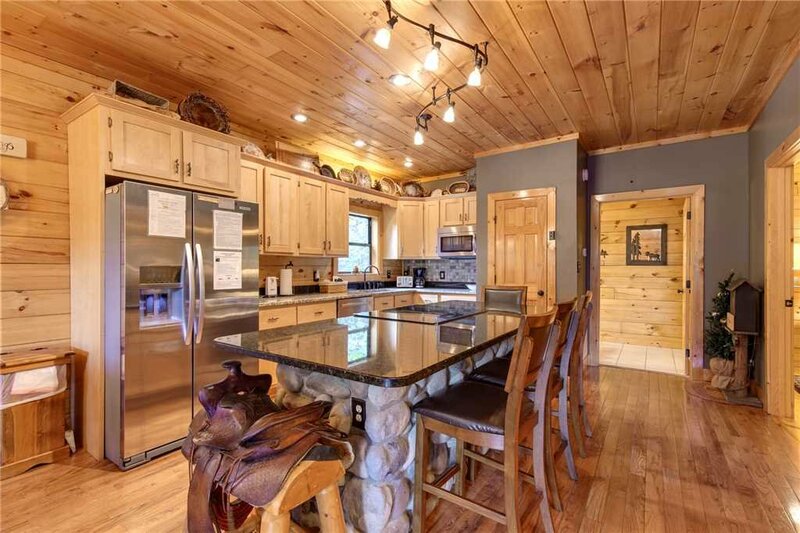 The breakfast bar doubles as additional kitchen counter space—and once you see how well equipped the kitchen is, you’re sure to want to eat at least a few of your meals in. 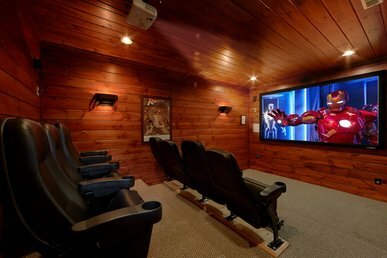 Another benefit to dining in is that afterward, you can head downstairs to watch a movie or the big game in Stonebrook Lodge’s home theater room. 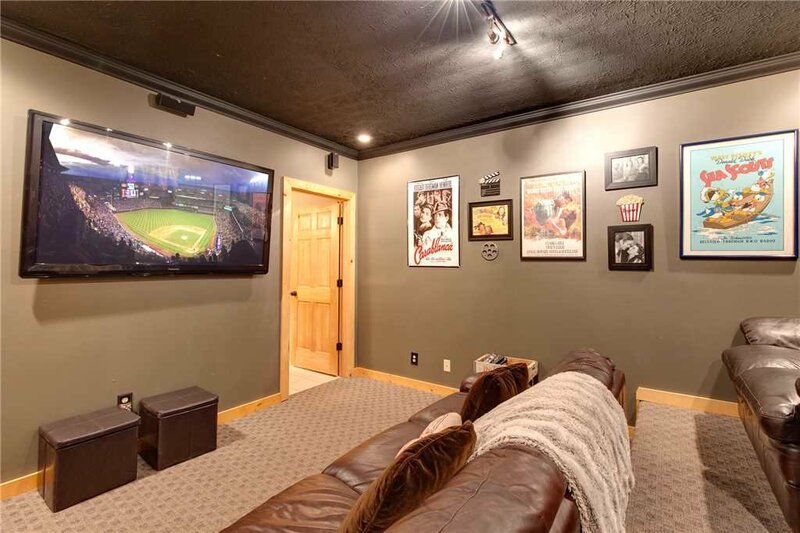 The 65” HDTV with Blu-ray isn’t the only attraction; the leather sofas are so sumptuous. 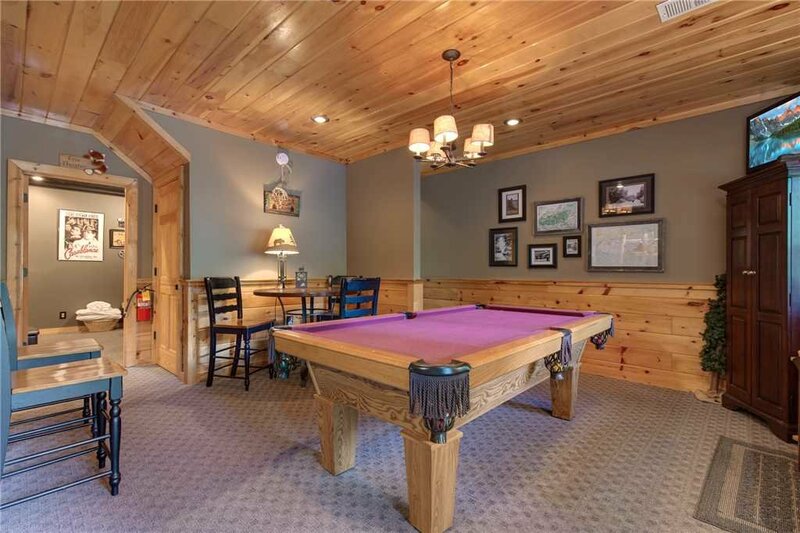 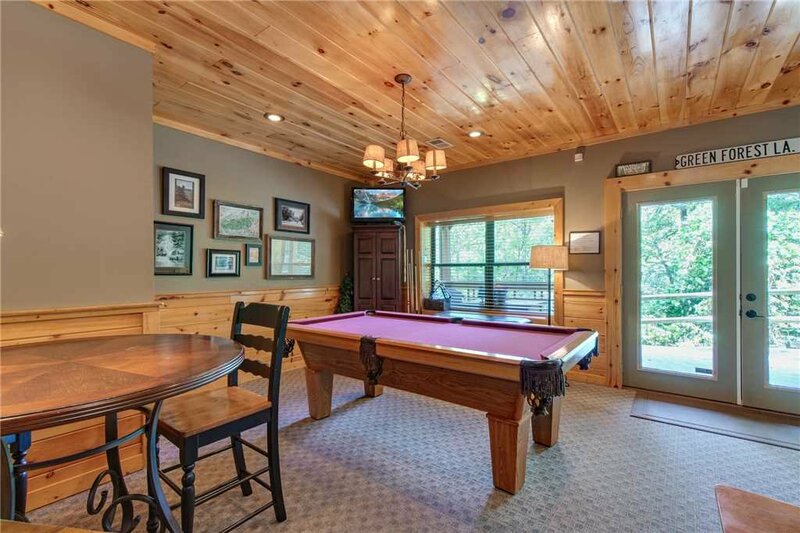 Next to the theater room is the game room, with a full-size pool table and a table where you can play board games or work on jigsaw puzzles. 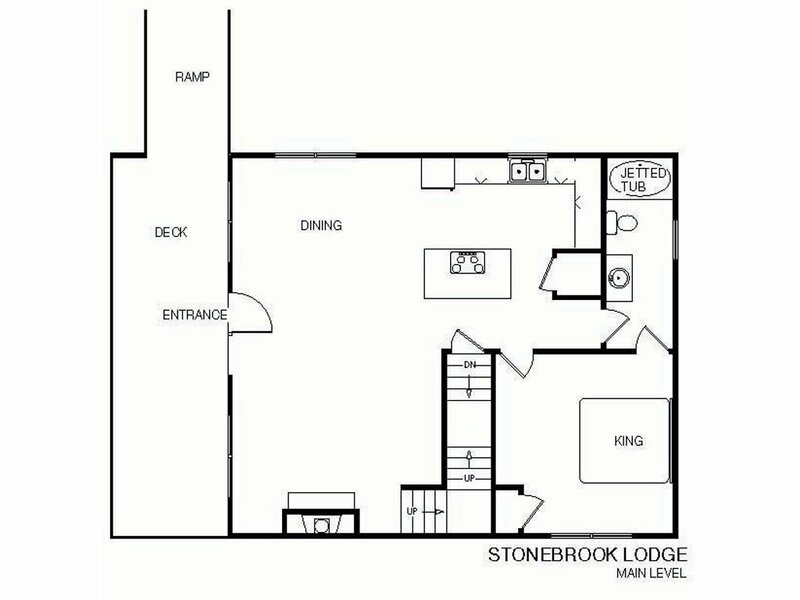 Three of Stonebrook Lodge’s four bedrooms—the two on the top floor and the third on the main floor—are master suites. 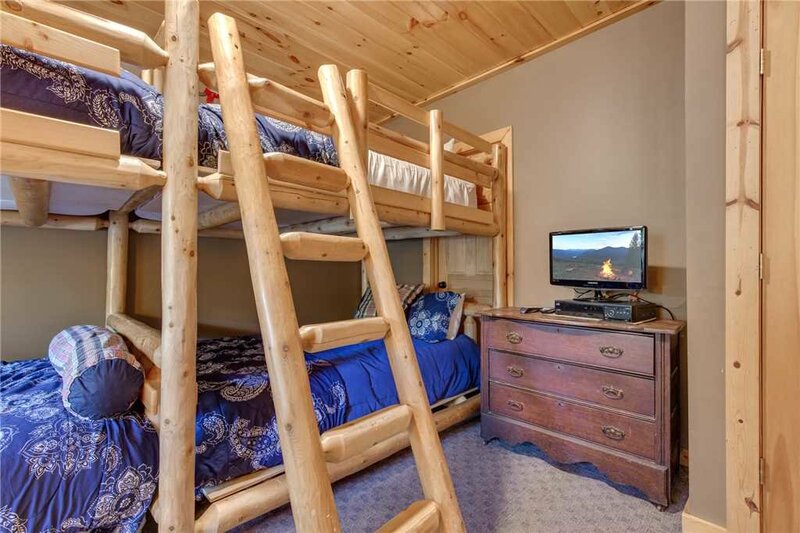 Each includes a luxe king-sized bed, a flat-screen TV, and views you’ll love waking up to. 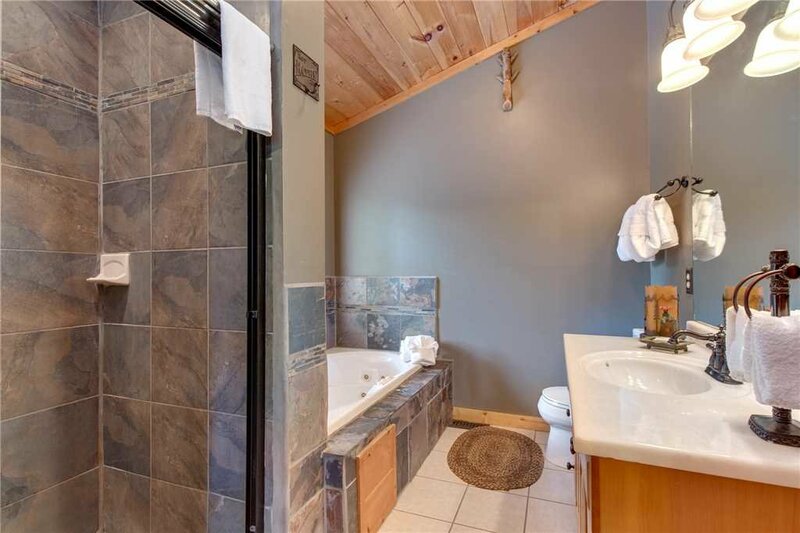 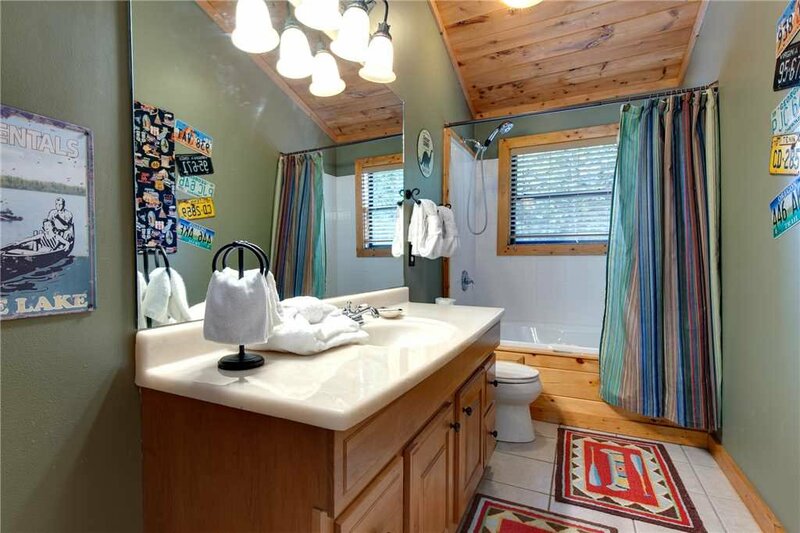 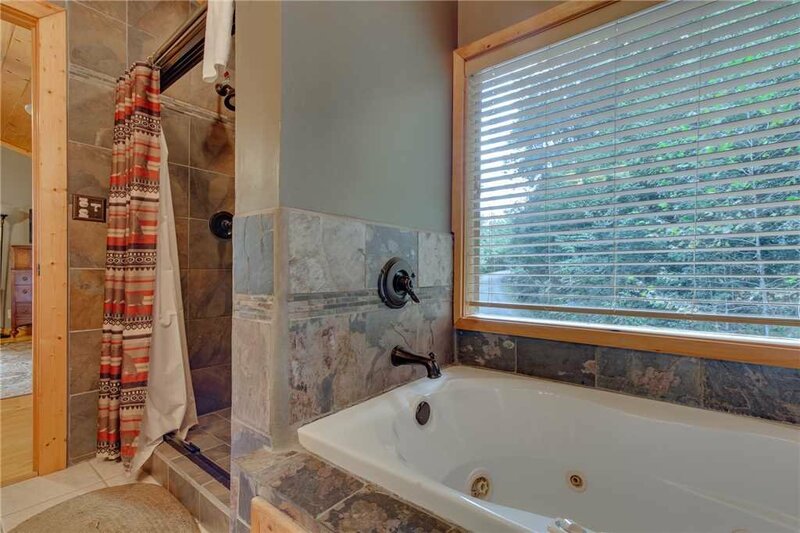 Each also has a private bathroom that includes a jetted tub. 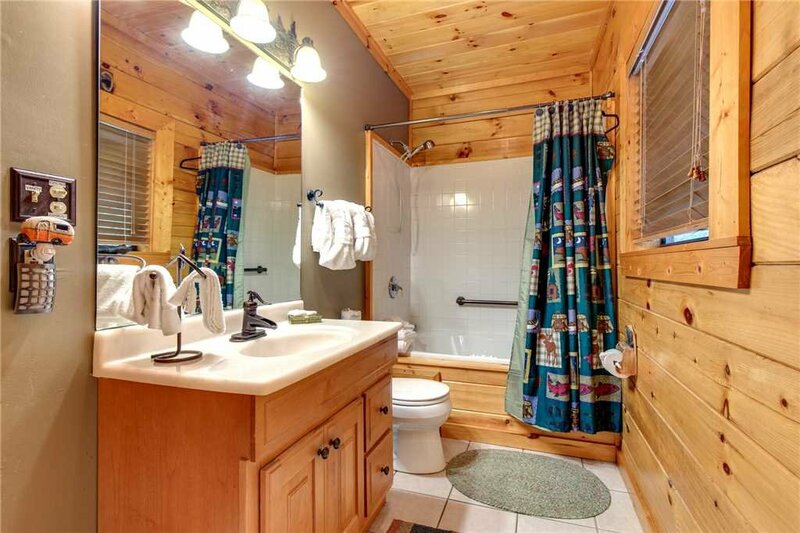 After a day of hiking, skiing, or rafting, you’ll want to make a beeline to those massaging jets of water. 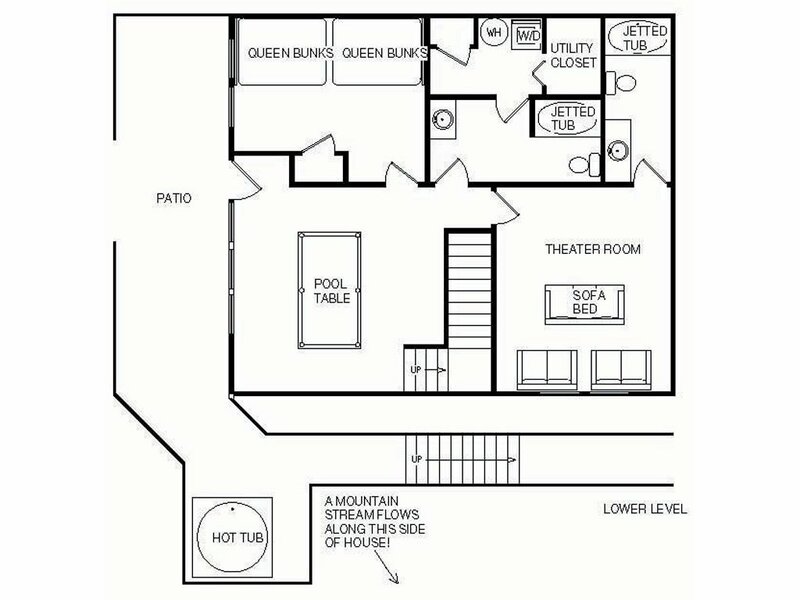 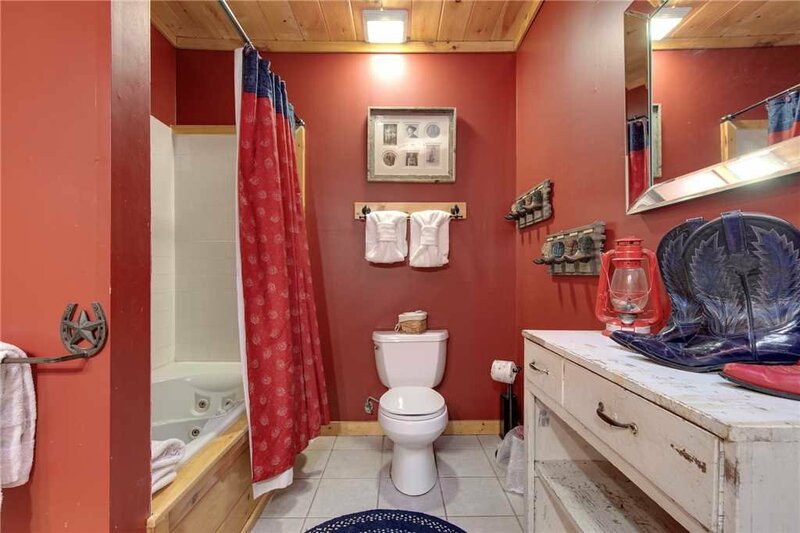 Two more bathrooms—and two more jetted tubs!—are on the lower level, as are a full-size washer and dryer. 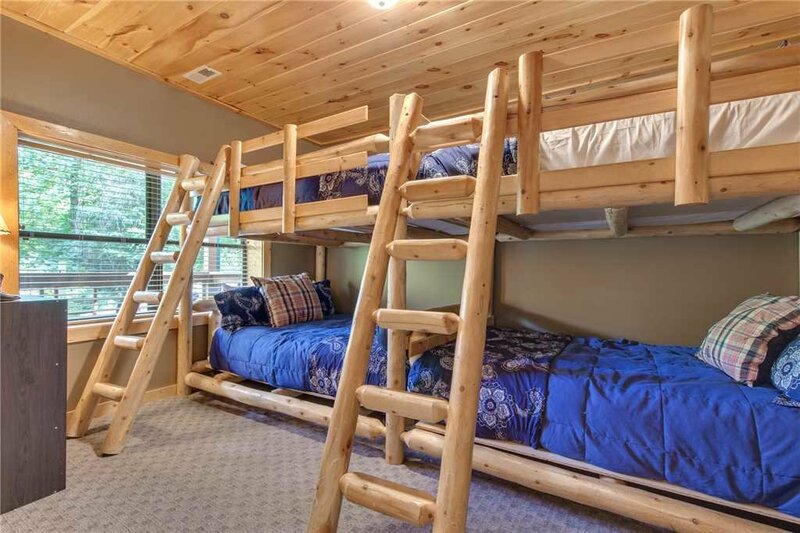 Also downstairs is the fourth bedroom; furnished with two queen-size bunk beds, it can sleep as many as eight people. 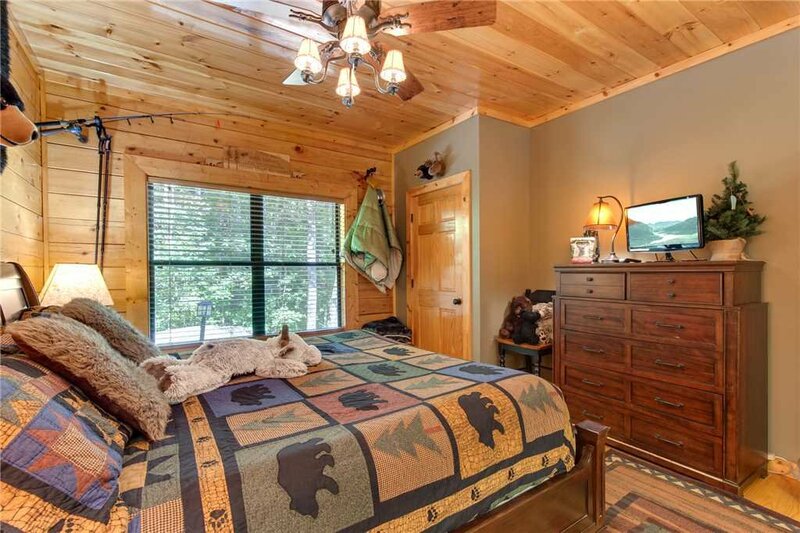 The kids will love making this room their private clubhouse. 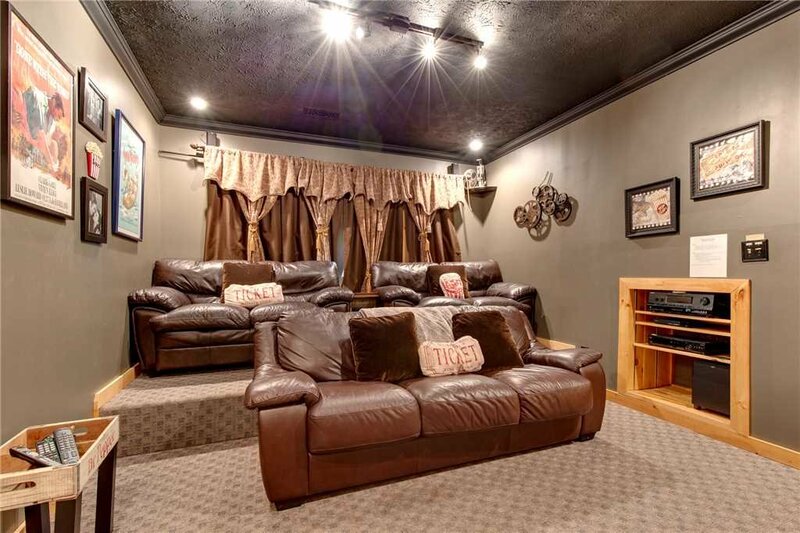 Besides, one of the couches in the home theater opens into a queen-size bed. 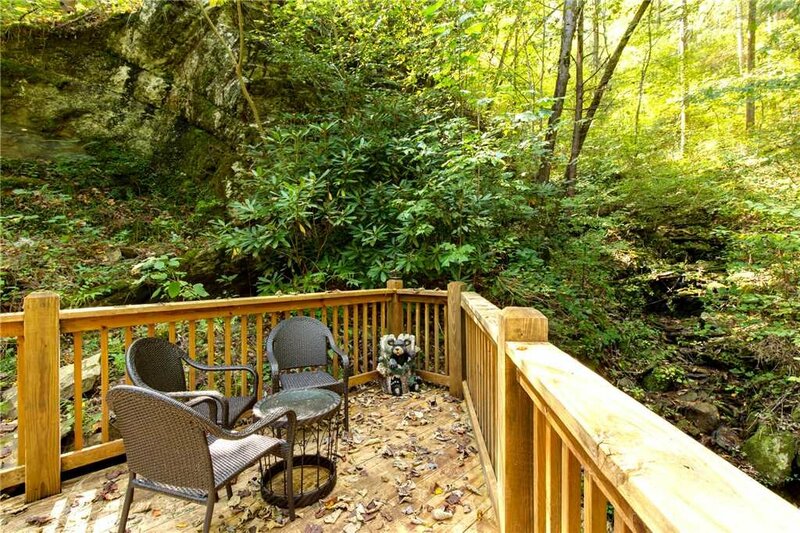 You might find it difficult to tear yourself away from the tranquility and comfort of Stonebrook Lodge. 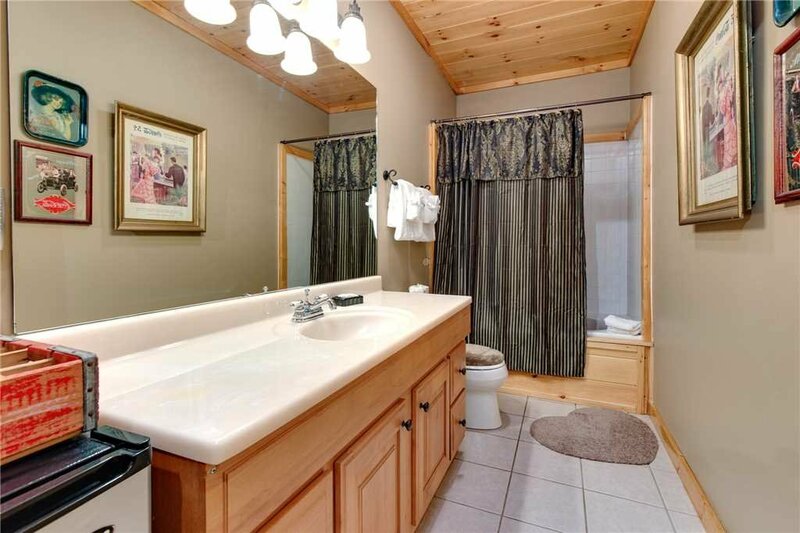 But, you won’t want to miss out on the many nearby attractions. 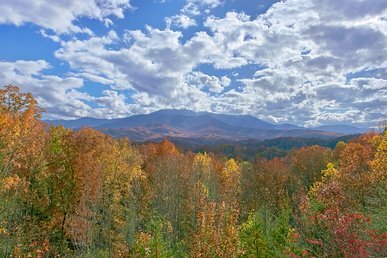 The Great Smoky Arts & Crafts Community, for instance, is less than fifteen minutes away. 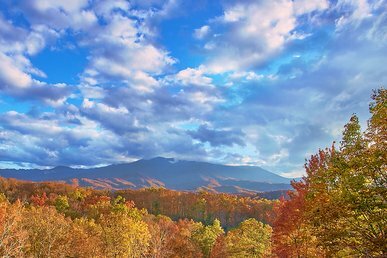 The Great Smoky Mountains National Park is only a twenty-minute drive, and Dollywood is a half-hour away. 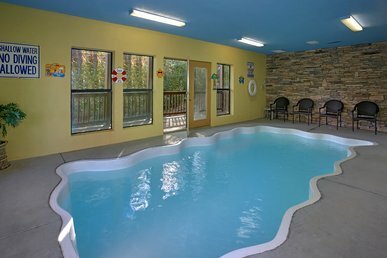 When you stay at Stonebrook Lodge, you’re sure to return home refreshed, relaxed, and rejuvenated… and looking forward to a repeat visit! 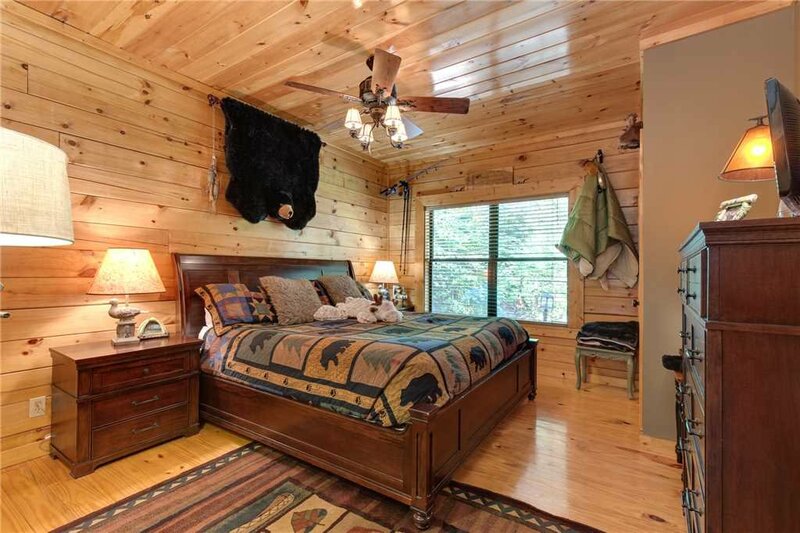 See for yourself: Book your stay today.